Here at Great Grass, we’ve often heard people worry that artificial grass simply isn’t compatible with their pets, or that their pets won’t be able to get used to a new artificial lawn after spending so much time with the feeling of real grass underneath their paws. It’s easy to see where those worries would come from, of course, but fortunately it’s not the case! What’s more, artificial grass is very low maintenance as it is, but coupled with the needs of your pets you’ll find even more tasks made easier. All of our grass lawns are permeable, allowing urine to drain away and faeces to be cleanly removed, and your pets will definitely appreciate the lack of chemicals and fertilisers that usually find common use on natural lawns. At Great Grass, we’ve gone to incredible lengths to ensure that our artificial grass not only looks as natural as possible, but also feels as soft and as realistic as it can do. With our innovative stitch technology and dedication to ensuring each individual strand of grass is as soft and bouncy as can be, you’re sure to be pleasantly surprised by just how comfortable and natural all of our artificial grass products can be – especially when they’re so incredibly hard wearing and resilient to being flattened or worn down. Even with your pets playing happily and boisterously on the grass day in and day out, you’re sure to find that your brand new artificial grass garden will stay looking top notch for a long time to come. So why not invest in artificial grass that you and your pets will love? When it comes to providing artificial grass which is ideal for pets such as dogs and cats to enjoy, there’s no one better than Great Grass to supply a range of artificial lawns perfect for creating a garden that your pets will love as much as you do. 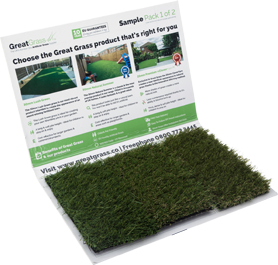 All you have to do is pick up the phone or drop us an email via our online contact details, and we’ll even send you a completely free sample so you can see that our artificial grass is definitely the right thing for you.